… came the form, came the thrill, came the life. A vivid B&W; fine drawing, Barry. Thank you Harrie. I had a blast doing this. Thank you… I had to nap afterward. Beautiful drawing, very intricate and delicate. Thank you… as I said earlier, “I had to nap afterward”. Woooohoooo!! The vibrations! Wildly alive. Shapes shift, move to the foreground and back. Visual polyphony. Makes me hear Stevie Ray Vaughan & Albert King jamming with Bach & Byrd. Well…if they could. You are a person of my heart… can we put Hendrix in the mix? Absolutely! Terrific! Maybe Clapton? And Muddy Waters? I just spent the past half hour on YouTube, soaked in the sound. What are we going to do when our memories fail… rely on Mumford and Sons? Only an optometrist knows for sure. No worries. Music’s what we are, the beat never ends. Someone told me that and over the years I’ve come to believe that he was right about it. I just posted a poem I wrote about this, circa 2008. Not sure if you mind links in comments or not (some people do) so I’m not leaving one. Title’s “We Are Music,” if you want to see. You make the best lines, lovely echoes, making shapes and forms! Not too bad sir. Staying low to the ground. Sheldon, all is fine. I’m doing the low profile thing. 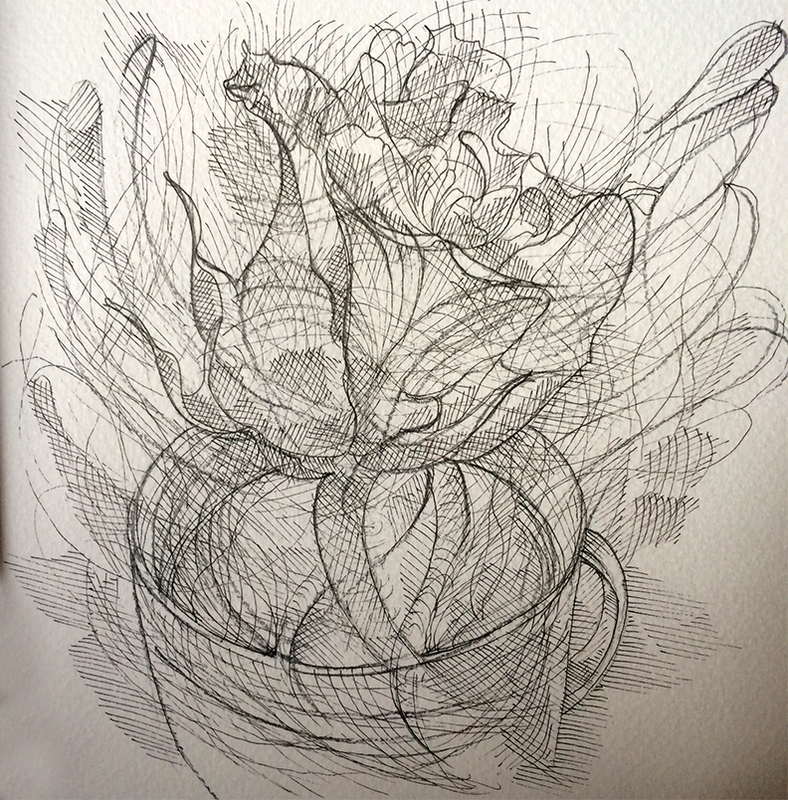 Love the physicality of this, Barry – lovely drawing! Love the way you reveal the flowering life in a cup of coffee, whose tendrils explore the threshold between the visible and the hidden… Superb! I’m certain you found the lines you were looking for! Isn’t it strange that a line has so much power? Isn’t it gratifying to write a merge the art?